Atlantic menhaden caught as part of Maryland's Estuarine Fish Community Sampling Program. Photo © Frank Marenghi, MD DNR. Atlantic menhaden (Brevoortia tyrannus) occupy estuaries and coastal waters from northern Florida to Nova Scotia and are believed to consist of a single population. 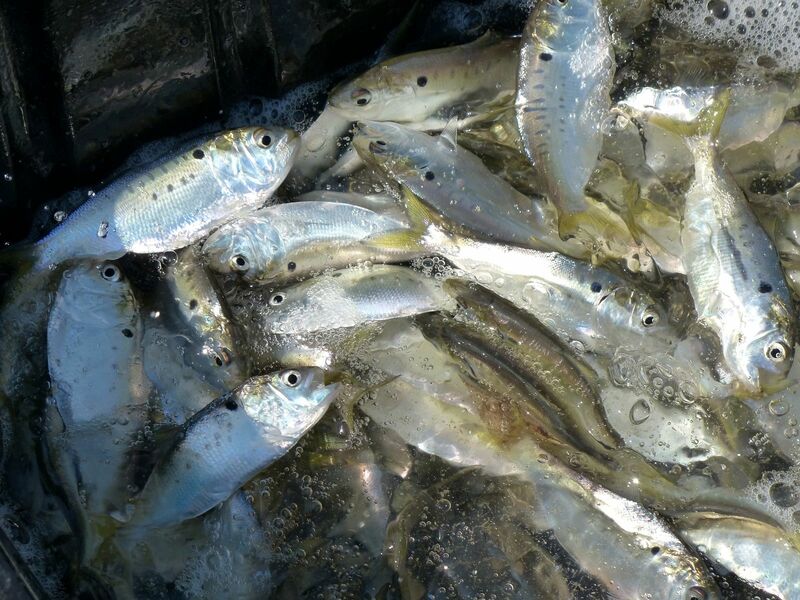 Adult and juvenile menhaden form large, near-surface schools, primarily in estuaries and nearshore ocean waters from early spring through early winter. By summer, menhaden schools stratify by size and age along the coast, with older and larger menhaden found farther north. During fall-early winter, menhaden of all sizes and ages migrate south around the North Carolina capes to spawn. Sexual maturity begins as early as age one to just before age three, with major spawning areas from the Carolinas to New Jersey. The majority of spawning primarily occurs offshore (20-30 miles) during winter. Buoyant eggs hatch at sea, and larvae are carried into estuarine nursery areas by ocean currents. Juveniles spend most of their first year in estuaries, migrating to the ocean in late fall. Menhaden are very efficient filter feeders. Water is pushed through specialized gill rakers that are formed into a basket that allows them to capture plankton. Menhaden are an important component of the food chain, providing a link between primary production and higher organisms by consuming plankton and providing forage for species such as striped bass, bluefish, and weakfish, to name just a few. The Atlantic menhaden commercial fishery consists of a reduction fishery (named because it "reduces" the whole fish into fish meal, fish oil, and fish solubles) and a bait fishery. The reduction fishery first began in New England during the early 1800s and spread south after the Civil War. The reduction fishery grew with the advent of purse seines in the mid-1800s and reached peak landings in 1956 at 712,100 metric tons (mt). At the time, over 20 menhaden reduction factories ranged from northern Florida to southern Maine. In the 1960s, the Atlantic menhaden stock contracted geographically, and many of the reduction factories north of the Chesapeake Bay closed due to a scarcity of fish. Consequently, reduction landings dropped to 161,000 mt in 1969. In the 1970s and 1980s, the menhaden population began to expand (primarily due to a series of above average year classes entering the fishery), and reduction landings rose to around 300,000-400,000 mt. Adult menhaden were again abundant in the northern half of their range and, as a result, reduction factories in New England and Canada began processing menhaden again by the mid-1970s. However, by 1989 all shore-side reduction plants in New England had closed, mainly because of odor abatement regulations. 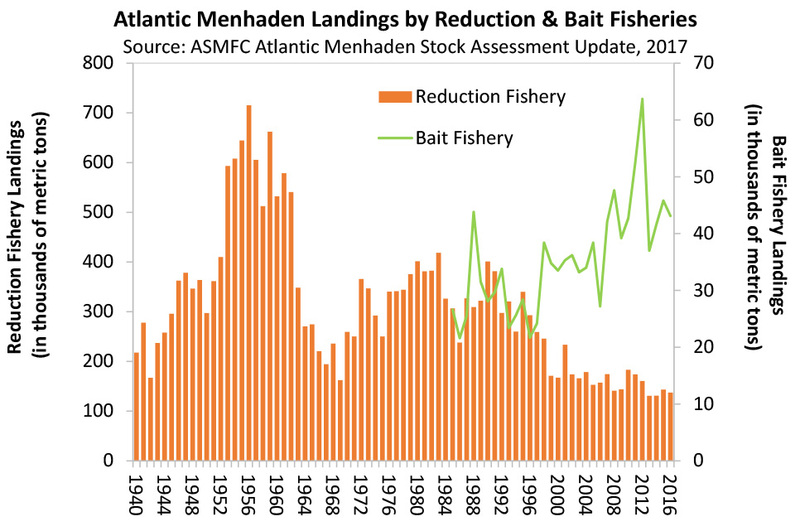 During the 1990s, the Atlantic menhaden stock contracted again, largely due to a series of poor to average year classes. Over the next decade, several reduction plants consolidated or closed, resulting in a significant reduction in fleet size and fishing capacity. By 2006, there was only one remaining reduction plant in operation on the Atlantic coast processing menhaden into fishmeal and oil. This is the Omega Protein plant, located in Reedville, Virginia, which is still operational today. In 2017, roughly 128.9 thousand mt were landed for reduction purposes. Commercial landings in 2017, including reduction, bait, bycatch, and episodic event landings, were 172,751 mt, or 86% of the TAC. This represents a 4.6% decrease in landings from 2016. 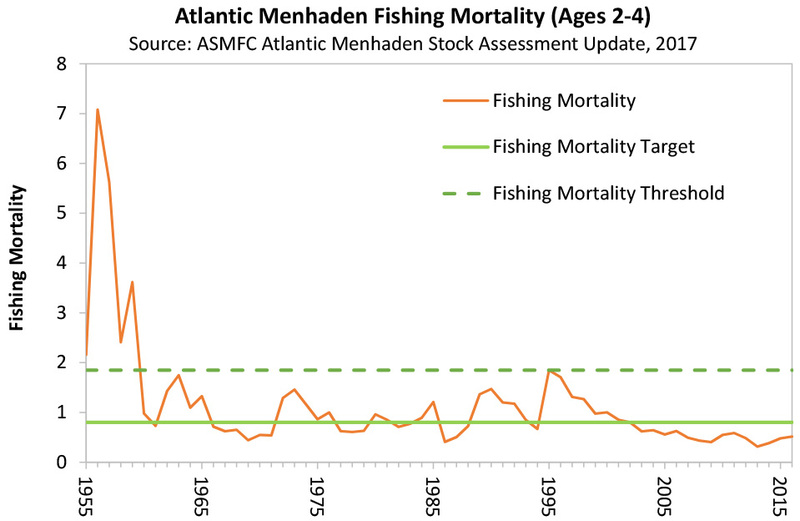 Based on the 2017 Stock Assessment Update, Atlantic menhaden are neither overfished nor experiencing overfishing. Stock status was evaluated against the assessment’s reference points, which used historical performance of the population during the 1960‐2012 time frame. Fishing mortality rates have remained below the overfishing threshold (1.85) since the 1960s, and hovered around the overfishing target (0.8) through the 1990s. In 2003, fishing mortality dropped below the target and was estimated to be 0.51 in 2016 (the latest year in the assessment update). Generally, fishing mortality has been decreasing throughout the history of the fishery. The biological reference point used to determine the fecundity target is defined as the mature egg production one would expect when the population is being fished at the threshold fishing mortality rate. Population fecundity, a measure of reproductive capacity, has been well above the threshold (57,295 billion eggs) and at or near the target (99,467 billion eggs) in recent years. In 2016, fecundity is estimated to be 83,486 billion eggs, still well above the threshold but below the target. 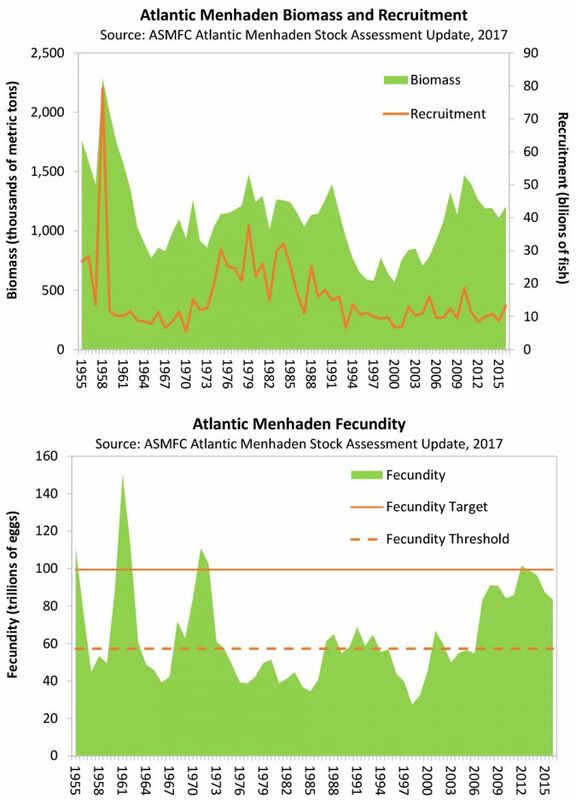 In 2018, the Commission continued to work on two Atlantic menhaden benchmark stock assessments: a single-species assessment and the highly anticipated ecosystem-based assessment, which aims to develop ecological reference points specific to menhaden. Both assessments will be used to evaluate the health of the stock and inform the management of the species in an ecological context. The Stock Assessment Subcommittee (leading the single-species assessment) also began exploring single-species modeling approaches while the Ecological Reference Point Workgroup, as the name implies, continued to explore modeling approaches that estimate the abundance of menhaden and account for the species' role as a forage fish. Both benchmark assessments will be peer-reviewed through the SouthEast Data Assessment Review (SEDAR) process at the end of 2019. Atlantic menhaden are currently managed under Amendment 3 to the Interstate Fishery Management Plan (FMP) for Atlantic Menhaden. Approved in November 2017, the Amendment maintains the management program’s current single-species biological reference points until the review and adoption of menhaden-specific ecological reference points as part of the 2019 benchmark stock assessment process. It also addresses a suite of commercial management measures including allocation, quota transfers, quota rollovers, incidental catch, the episodic events set aside program, and the Chesapeake Bay reduction fishery cap. In addition to its Amendment 3 deliberations, the Board set the total allowable catch for the 2018 and 2019 fishing seasons at 216,000 metric tons with the expectation that the setting of the TAC for subsequent years will be guided by menhaden-specific ecological reference points. Amendment 3 also changes fishery allocations in order to strike an improved balance between gear types and jurisdictions. The Amendment allocates a baseline quota of 0.5% to each jurisdiction, and then allocates the rest of the TAC based on historic landings between 2009 and 2011. 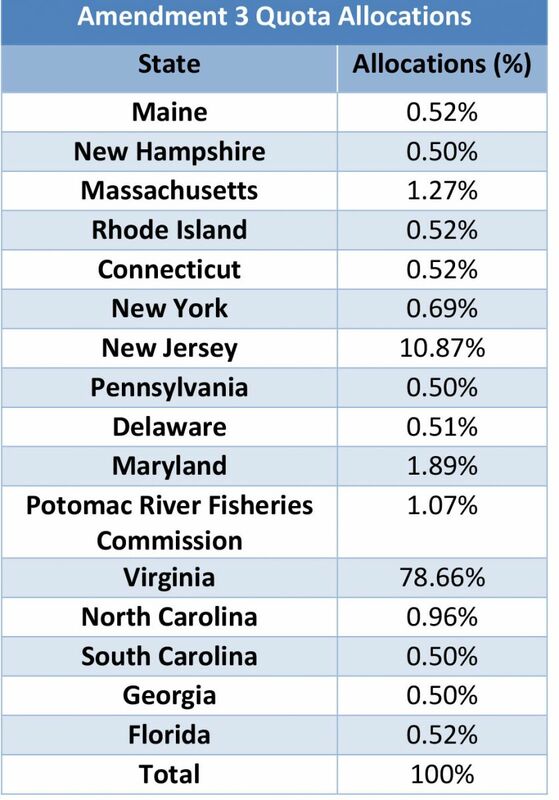 This measure provides fishing opportunities to states which currently have little quota while still recognizing historic landings in the fishery. The Board also agreed to maintain the quota transfer process, prohibit the rollover of unused quota, maintain the 6,000 lb trip limit for non-directed and small-scale gears following the closure of a directed fishery, and set aside 1% of the TAC for episodic events in the states of New York through Maine. Finally, the Amendment reduces the Chesapeake Bay cap, which was first implemented in 2006 to limit the amount of reduction harvest within the Bay, to 51,000 mt from 87,216 mt. This recognizes the importance of the Chesapeake Bay as nursery grounds for many species by capping recent reduction landings from the Bay to current levels.